When I was age 4 through 9 my uncle and father owned an auto part store right at the corner of 126 and 135. 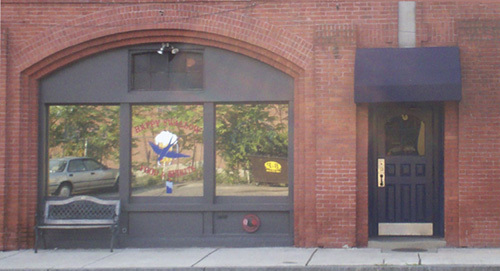 My sister and I would hang out there all the time and noticed “The Happy Swallow” one storefront away and wondered what it was. I remember I couldn’t even read yet but there was a bird on the sign with a martini glass, I didn’t even know what a martini glass was but I thought since it had a bird on there it must be a good place. They have since replaced the martini glass with a beer mug on their new sign and I finally went to go check it out. I gave Ethan the night off and dragged my friend Mike to go with me. It was just what I thought it would be like: old, somewhat dingy and in a weird way “homey”. Mike and I went up to the bar and got a couple of beers and I asked the bartender if we should order though him if we want something to eat. He said to hold on a sec and went over to the kitchen and asked the guy in there “What are we doing about food?” he came back and said someone would be over in a few minutes so we sat down and checked out the menu posted above the pick-up window. 5 minutes later an older man comes over to our table and asks “You wanted some food?” and we ordered a couple of burgers. Then Mike saw lettuce and tomato was 50¢ extra and we hadn’t asked for it but wanted it so he went back up to the window to ask for the kitchen guy to add that and the guy said “oh, you could have told me that before- that’s ok, that’s ok” Which was kind of funny since he hadn’t even started making anything yet. 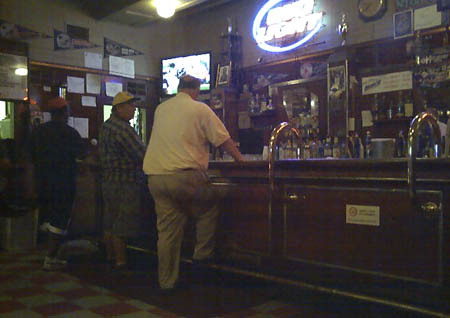 I thought it was interesting that there are no stools at the bar, people just stand. There are stools at the tall tables but they aren’t bolted down like adamg described, perhaps in their wilder days though. 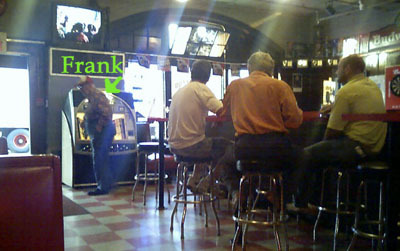 They were laughing like it was an old joke or maybe he notoriously plays bad songs but Frank just ignored this and just shuffled back to his booth. 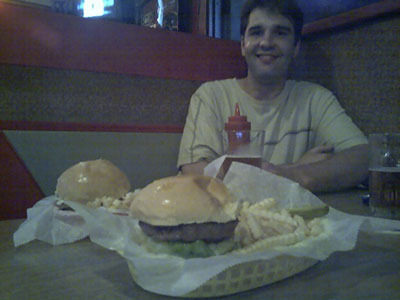 The burgers were pretty good, I guess were expecting the worst but I think they really were pretty good. Mike went to the bathroom and took a picture because he was weirded out by the urinal that reached the floor. 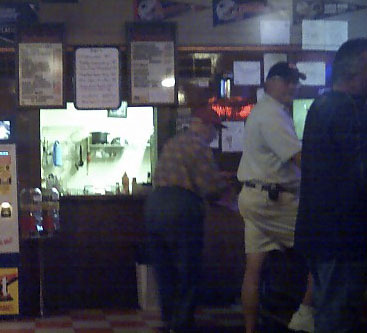 While Mike was in the bathroom, the kitchen guy was leaving for the night and walked by the bar where the bartender yelled out “Have a good one Fred” (or Red or Ted). When he walked by my table he stopped to look at me and said “Goodnight, girl”gave a little smile and walked out the side door. P.S. They also have live music on the weekends, I’m curious to see where they fit the musicians. My friend’s blue’s band plays there about every other month and it can get pretty lively. Not I can’t lift my arms to scratch my nose lively, but a good, not too crouded, party atmosphere type of lively. The cheap beer prices do attract some interesting characters, but I have never run into any trouble the 3 times I have gone there. If anyone is interested, Clay Brown and the Black Cat Bone Band will be playing there on September 16th. FRANK ROCKS! I don’t really know him, but I’m pretty sure he ROCKS. 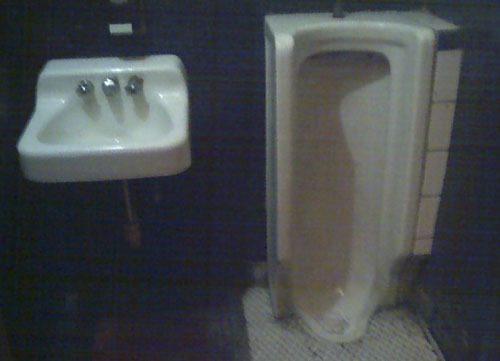 That urinal that reaches all the way to the floor could probably be sold on Ebay for some good $. haha, you’re adventurous. Corner of 135 and 126, then? I can’t believe anyone actually ate at the swallow. I have been going off and on for 5 years and have never, ever seen anyone eat anything in that place. -Fun, uptempo dance music – Think Mardi Gras music, with Accordian, Scrub Board and beads! The Red Sox are off, so we hope to see you there!